This statement might lead you to think Sepia is an abstract fragrance without a figurative anchor, but that’s not true. But it’s also not true that Sepia is a Demeter-like recreation of an existing odor — in this case, the scent of the California ghost towns that inspired Sepia. Instead, Sepia is an unusual blend of mood and reality, a fragrance that evokes a definite physical presence as well as the aura surrounding it. Sepia’s top notes are blood cedarwood, pink grapefruit and yellow mandarin; its heart is pink lotus, jasmine, strawberry, cocoa and coffee; and its base is indole, ambergris, tobacco, labdanum, cepes and oud. Aftel documented Sepia’s creation in a series of letters to Laurie Erickson of Sonoma Scent Studio on Nathan Branch’s blog. The letters start here. Sepia is a freaky little perfume. Its soft fruit, wood and tiger’s eye-glint of ambergris draw me near, but an animalic, fusty aspect keeps me from getting too comfortable. If I accidentally put my hand in a puddle of Sepia and didn’t know what it was, I might rush for a bar of soap, not sure what compost bin casualty had left the puddle behind. But I know I’d drop the soap instantly and spend the next few hours walking around with my hand plastered to my nose, trying to get to the bottom of this mysteriously beautiful fragrance. Don’t think that the fragrance is dense and oily, though. Sepia has the feel of a thick down comforter — full of both presence and loft. I’m also afraid I’ve made Sepia out as a simple mix of fruit, wood, and rot, and that’s not true at all. It’s a moody, complex fragrance. In the end, to me Sepia does smell like a ghost town washed with rain and whose buildings are still home to decrepit horsehair sofas and dusty windowsills. But along with this physical evocation of a desolate town, long abandoned, I smell some of the life I imagine used to be there, too — the horses, the letters, the darkened sheds. Ennio Moriconne and Jack White could write the soundtrack. I've sampled Sepia Eau de Parfum off and on for about ten days now, and although I was intrigued right away, I've liked it the more I've worn it. If you do sample Sepia, be sure to give it at least three wearings before passing judgment. Aftelier Sepia is impossible to assign a gender to. It lasts about three hours on my skin and has moderate sillage. Sepia is available in 30 ml Eau de Parfum spray ($150), or in 2 ml ($45) or 1/4 oz ($150) Parfum. Samples are also available. 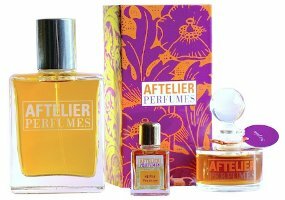 For information on where to buy Sepia, see Aftelier under Perfume Houses. Note: top image [cropped] via press materials. I love that sepia toned pic:). I would be interested to sniff this scent as well:D.
It’s a fascinating fragrance–not what I expected, but isn’t that the best, anyway? At the same time, though, I got a sample of Tango EdP, which I’d only tried in the parfum version, and that’s the one I’d really love to have a bottle of. It’s a strange perfume, Sepia is, but that’s part of its attraction for me. I can completely understand being on the fence about it, but be sure to give it that third try! That also reminds me..I need to try some samples from Sonoma SS.:D. Oh, me, too. I hear such good things about them. Hmmmm….the pic looks like Bodi, one of my husband’s favorite places o Earth. I often think he must have lived there in a former life. I am SO intrigued by the sound of this fragrance, but woods have become a no-go for me over the last year. I don’t know if I have just become hyper sensitive or what, but they blow up one me to the point where I have to scrub them off. I used to wear a lot of woody men’s scents, and I just can’t tolerate them any more. This one would be terrible for you, then. At least you can enjoy the photo! Am desperate to try this. This sounds really intriguing- I love the idea of evoking a ghost, be it town or person, with fragrance. Thanks for a great review, Angela! Btw have you tried the Safari yet? I’d love to know what you think! I have tried the Safari you sent–thank you! It’s a great one for spring. It’s so full-bodied but green. I found a mini of the parfum at Goodwill and snapped it up. You definItely have the blessing of the Goodwill Gods! I am so glad you like it- it really is perfect for spring. I’m wearing Mecca Balsam today and I am so grateful that you introduced me to it! I doubt I’ll try this purely down to the price but I really love the sound of it. Perfumes to me need to be more about this kind of…feeling rather than some any-old-juice poured into a bottle fronted by a celeb who is the current big thing. This sounds very much something I would wear…maybe I should hunt down a sample from somewhere after all. If it crosses your path, I think it really is worth a sniff. It’s a little bit of a challenging fragrance, but engrossing all the same. This doesn’t sound appealing at all, to my mind. I’ll be giving it a miss, especially at that price. I suppose it’s hard when you’re a small, independent perfumer to get the fabulous bottles you could envision for each fragrance. I’ve seen Aftelier package perfume solids in vintage compacts, though. That would suit this fragrance. I love fragrances that evoke a mood or a place too. The notes in this are not grabbing me. I like woods but the grapefruit and strawberry are making me think I’ll pass on it. At least for now. I’ve tried Parfum Privé and Tango and really enjoyed them. My nose and animal brain love the unusual natural ingredients, which really shine in her subtle compositions. I’m adding this to the list of those I MUST sample when I order the bottle of Tango I’ve been promising myself. Parfum Privé is such a nice one. Secret Garden, too. I’d love to know what you think if you try this one! Lol, Angela – you and your “rot” fragrances. I tried Onda by Vero Profumo after your beautiful review, and after that experience, it would only be with trepidation that I’d try another! I love a quirky perfume, but it was hard to stomach Onda, I’m afraid. Such a shame… However, I think I’ll still give Sepia a try – if anything, the CONCEPT is beautiful, and worth a smell for that alone. Onda is a tough customer (but so beautiful! really!) that I’m sympathetic to your being hesitant to test Sepia. Still, Sepia is less fierce and easier to try. It’s rewarding, but not really super easy. I’d love to know what you think of it! Lovely review, as ever. But three hours is not fantastic. I love the idea of the artistry and the creativity in Sepia, but my hard-earned perfume dollars just have to work a bit harder for me than that. There are many perfumes that evoke distant and exotic places, but not so many that evoke HISTORIC places as well, at least not as specifically as this. Parfum d’Empire evokes past eras, but in a more abstract way, without (it seems) Sepia’s attention to specific detail. It’s true that Sepia doesn’t have great lasting power, and I’ve found that true of lots of naturals, unfortunately. You have such a good point about historic places! Now I’ll be wracking my brain all day thinking of historic places that have (or haven’t) been translated into fragrance. You’re welcome! Thanks for making such an interesting perfume to review. Wonderful review, Angela. I especially enjoyed reading it after following Mandy’s and Laurie’s correspondence on Nathan’s blog. Thank you! I love your new gravatar image, too. The colors are gorgeous. I got a sample of the Sepia EDP recently, along with a few others, and I keep trying it. I think maybe the jasmine sambac and then additional indole in the base is just too much indole for me, because it seems that the indoles just take over on my skin and crowd out everything else. When I first put it on, the opening was honey-like and almost cloyingly sweet, but then that fades and goes really barnyard-y on me. I’ve tried it a couple more times to see if it might vary on a different day, but so far not so much. I did find (kind of accidentally) that Sepia layers well with Haute Claire (on me, anyway). There is something in Haute Claire (the vetiver, maybe? ), that kind of takes all the indole and puts it in time-out so that the other notes, the labdanum, ambergris, etc, can have their moment in the sun. Then toward the end of the dry-down, it lets the indole come back out again, but only if it uses it’s inside voice. Lol thanks! I’m pretty new to all this, so I’m kinda proud of myself for that. On further thought and reading, I’m not entirely sure that what I got at the end was actually the indole being allowed out of time-out (maybe it got sent to bed..ha).. I’m not really familiar with oud, but after reading descriptions of it as having a “medicinal” edge, I’m not sure if that was actually what I was getting. Also.. I will mention that I really like the Haute Claire on its own. A sparky edge of galbanum around a round, creamy floral, which gives way to vetiver and vanilla. Unfortunately my sample leaked in shipping, though there was still enough to get a little bit of use out of it. The box smelled fantastic, though. At first I thought maybe the tissue paper in the box was perfumed, which would have been awesome.. until I took that sample out of the box. Oh well.. guess I’ll have to get another one. how awful. I decided to give Sepia another shot today.. mostly because I still have some left in my sample, and it had been about a week or so since the last time I tried to wear it. And I wonder if maybe my indole-o-meter is more sensitive at certain times of the month or something, because this time was markedly different from the last. The funk was there, but it wasn’t bad. It didn’t seem to dominate as it had before, and I could actually smell the other notes. It’s still probably not one I would wear all the time, but I think I kind of get it now. Isn’t it an odd one? I definitely went through a whole menu of responses before Sepia settled into me. I’m not sure it’s one for me to wear regularly, either, but I love having my sample around. I tried this one, and it simply smelled like a tire store on me. I really like Lumiere and Candide, though. And the Pear/Fir/Coffee oil is a treat; I like to smooth it over my hair. Tire store–that’s so funny! It’s definitely an odd one, that’s for sure. Well, I hope it doesn’t sound as though I’m insulting her perfume. I think that Sepia also smells like creosote which might be more in line with the scent of a California ghost town. Hard to say since I live in Kansas and haven’t been to CA ghost town. What I do appreciate about Sepia is that it was created because of a vision and a concept. It exists as a fragrance to evoke a feeling, a mood, or maybe an image. I admire Aftel for sticking to her beliefs, visions, and creative ideas even though her product might not please the masses. Oh no, I didn’t think you were insulting her at all! I agree with you–she’s a real artist, and even when I don’t need one of her fragrances for myself, I’m always eager to smell them. I admire her a lot, just like it sounds like you do.